The Kasba Villa is one of 10 private luxury villas in the secure 12 acre walled domaine. Entry to this exclusive development is over a private bridge through a magnificently imposing entrance with full 24 hour security. Located in Southern Morocco, just 8 miles south of the great imperial city of Marrakech and its ancient medina, famous Jemma el Fna square, fragrant spice markets, stunning architecture and bustling souks. Marrakech's ancient and picturesque red city has the Atlantic Ocean 100 miles to the west and the majestic Atlas Mountains 30 miles to the south and east. 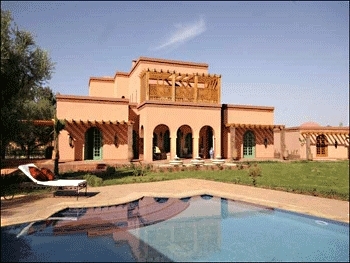 The domaine is just 20 minutes by car from Menara (Marrakech) airport. This luxurious, majestic villa has a wonderfully relaxing atmosphere and spoils the occupants with stunning architecture and peaceful surroundings. An exclusive stay at the Kasba villa retreat offers a heavenly oasis of relaxation and grandeur and combines all the luxuries of a five- star hotel with the privacy and tranquility of your very own personal space. Just 20 minutes after departing Menara airport you can be relaxing by Kasba's impressive private infinity pool or pouring yourself a chilled glass of complementary wine on the terrace. Once inside the magnificent villa, it is your home. You are free to indulge your senses and lose yourself in the serenity of an acre of lush palm gardens surrounded by blooming roses, calming water fountains and olive trees, take a dip, soak up a mesmerising view of the High Atlas Mountains from the glorious master bedroom terrace or simply dissolve into a hammock and enjoy one of Morocco's legendary 300 days of yearly sunshine. Whilst you relax, your Moroccan home will be kept beautifully clean and tidy by a discreet team of housekeepers and maids and an optional private chef can cater to your every gastronomic whim should you wish to savour the very best of traditional Moroccan and European cuisine. By day or by dusk you can be served poolside, in the lovely dining room, or enjoy the candlelit delights of your own secluded outdoor dining terrace. Whatever your tastes, a team of charming and hospitable staff will endeavour to please - be it home-pressed orange juice and freshly cooked pancakes alfresco for breakfast or a traditional tagine and couscous under the stars at night.